Welcome to my blog post – this month it is all about sharks! I was recently watching a BBC documentary (imaginatively titled ‘Shark’!) which first aired in 2015 and I was fascinated by one of the scenes in the documentary. It wasn’t a scene of a great white nor any impressive acrobatics of sharks jumping out the water, it was an incredibly detailed scene of developing shark embryos and was cleverly filmed to show the shark embryos mature into baby sharks - this is what inspired me to write this blog post. I must admit, sharks have always captivated me. They may not look as ‘friendly’ as some of the oceans other species however, their history and evolutionary characteristics are quite remarkable. The first sharks appeared around 400 million years ago, and they have evolved over time to develop electroreception. This means they have several gel-filled pores on their head which enables them to detect minute electrical currents (meaning they can sense even the smallest fishes in the ocean). Combined with excellent hearing, sight and smell, electroreception is just one characteristic that makes them the ultimate hunters. Now, I don’t know about you but I’ve always pretty much known sharks are not mammals, they are in fact, fish (albeit incredibly sophisticated ones!). It is often assumed that whales and dolphins are also fish, but they are actually mammals. One of the defining features of a mammal is that they give birth to live young, so you may be surprised to known that while approximately 40% of shark species are oviparous (meaning they lay eggs), around 10% of species give birth to live young (viviparous species). A further 25% use a mixture of the two methods! Despite this, sharks are classed as fish as they lack several important characterises that would otherwise class them as mammals. For instance, sharks are not vertebrates (a sharks skeleton is composed of cartilage much like human noses and ears, not bone). 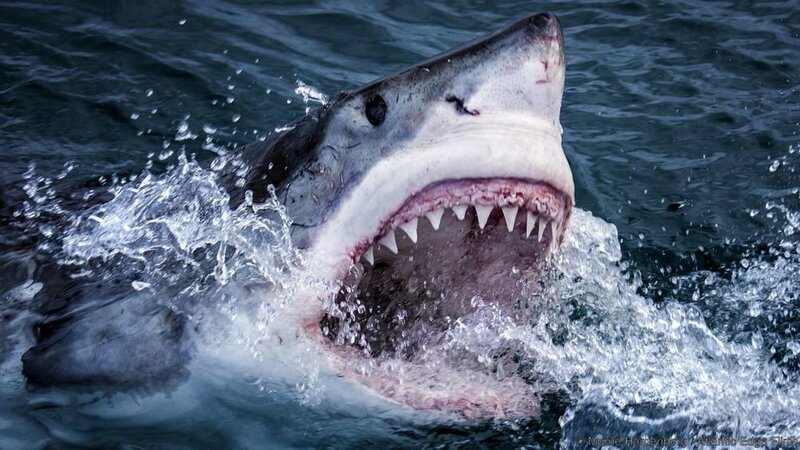 The advantage of having cartilage rather than bone enables the sharks to turn quickly whilst hunting prey), they are not endothermic (warm-blooded), nor do they produce milk to feed their offspring. The image of the sharks egg was particularly fascinating as they are almost transparent when a light is shone through them, which allows you to see the embryo developing (see pictures below). ﻿ The shapes of the eggs are wide ranging and are commonly known as a ‘mermaid’s purse’. The pictures below were taken by me of a Whitespotted Bamboo Shark, Chiloscyllium plagiosum, in Canada. When I first saw the egg capsules, I didn’t believe they were real! They were so well formed and symmetrical I was convinced it was some clever robotics – they are actually quite mystical and it is difficult display that on a TV or computer scene, you have to ‘see it to believe it’. It’s quite fascinating how their egg capsule contains all the nutrients the embryo requirements within a yolk, which enables the embryo to survive independent of their mother from when are laid, to when they hatch approximately 4 months later. Documentary programmes have become increasingly popular. For instance, Planet Earth II is one of the most delightful and well informed documentaries I have seen in years. I was also pleasantly surprised to hear it has more viewers than X factor! It’s wonderful to see that many people are interested in learning more about the fascinating life forms on planet Earth, and hopefully will encourage our current and future generations that we need to do all we can to keep these species alive and help combat the challenges they are facing from hunting, land and sea pollution, habitat disruption and climate change, but that’s a blog post for another time.